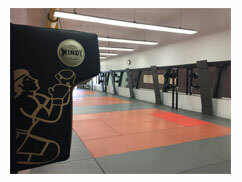 Utilizing the Eastern fighting style of Muay Thai Kickboxing, this class incorporates punching bags, gloves, and ropes to develop physical strength, endurance, and confidence. It will also relieve stress, improve muscle tone, and burn up calories. All participants given a pair of bag gloves (included in price).